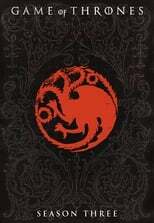 The third season of the epic fantasy drama television series Game of Thrones premiered on March 31, 2013 on HBO. HBO renewed the series for a third season on April 10, 2012, nine days after the second season's premiere. Production began in July 2012. Like the other seasons, the third season consists of ten episodes. It is based roughly on the first half of A Storm of Swords of which the series is an adaptation. Jon meets the King-Beyond-the-Wall while his Night Watch Brothers flee south. In King's Landing, Tyrion wants a reward, Margaery shows her charitable nature, Cersei arranges a dinner party, and Littlefinger offers to help Sansa. Across the Narrow Sea, Daenerys starts her journey west. Sansa says too much. Shae asks Tyrion for a favor. Jaime finds a way to pass the time, while Arya encounters the Brotherhood Without Banners. Tywin plans strategic unions for the Lannisters. Melisandre pays a visit to the Riverlands. Robb weighs a compromise to repair his alliance with House Frey. Roose Bolton decides what to do with Jaime Lannister. Jon, Ygritte, and the Wildlings face a daunting climb.